Considering I’m a full-time blogger and Etsy seller, you’d think I’d be more techie. And to a point I am… I love my camera, my iPhone, and my iPad (everyone should have one of those), but I’m generally unimpressed with most of the tech in our house. Except for the label printer! I can’t even begin to tell you how much time I’ve saved thanks to our Dymo LabelWriter 4XL printer. We got this printer a couple of years ago when we first started printing our labels with Endicia and the combination of the two has just been a whole new world. To help you get ready for a great holiday season, Endicia is offering an exclusive discount to our readers. For a limited time you can get the Dymo LabelWriter 4XL label printer (which just keeps on printing… the rolls go on and on and you never need to buy ink) for just $159.95 – it’s the lowest price I’ve seen to date. The way we use this printer every day is in conjunction with our Endicia account. 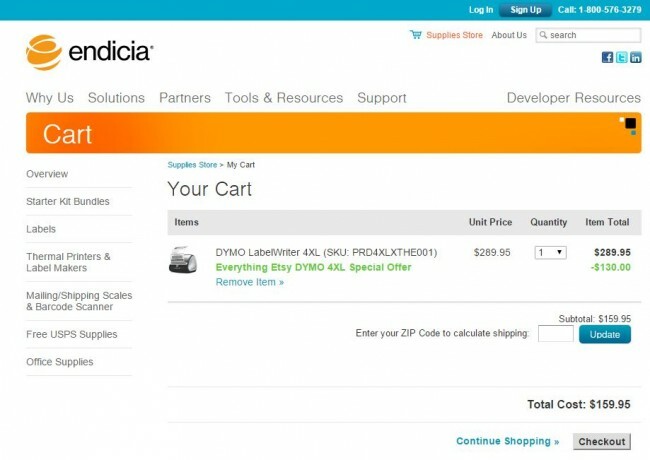 Endicia is an online shipping provider and is a great tool for keeping all of your shipping label purchases in one place and at the best possible cost. One of the things we love about Endicia is that they are constantly upgrading with services that are designed specifically for online sellers like us. And if you ship to Brazil or Mexico you really want to know about the new Endicia Global Service which is going to transform e-commerce with Latin America. Combine the sale above with this special offer from Endicia and you’ll soon find yourself set-up to ship like a pro! Anyway, I didn’t mean to ramble… I just wanted you to know about these deals. This code didn’t work for me…is it supposed to still be vaild? Hi. I also was not able to get the code to work. Is it expired? where is the date for your posts? it is hard to tell if the information is current.